With virtual reality, it’s now possible to fly like a bird. 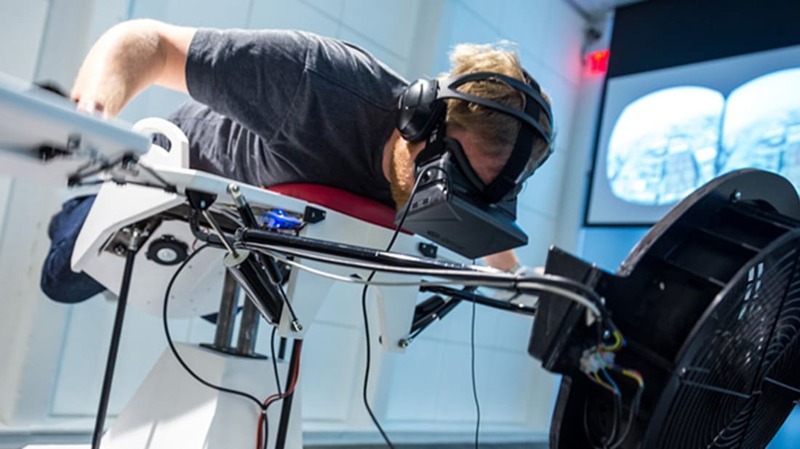 Birdly, a virtual reality simulator powered by Facebook’s Oculus Rift technology, allows you to feel like you’re soaring through the air on wings. Created by designers at the Zurich University of the Arts, Birdly gives you a bird’s eye view of an urban downtown. Headphones play the sound of wind—which, thanks to a fan, you actually feel—and you can turn and move through the simulation by moving your arms and hands much like you’re flapping your wings. The combination of coordinated visual, aural, and tactile feedback make it more tangible than your average video game experience. You don't have to travel to Zurich to check it out. Birdly will be on display at the art and science gallery Le Laboratoire Cambridge between December 2 and 5.